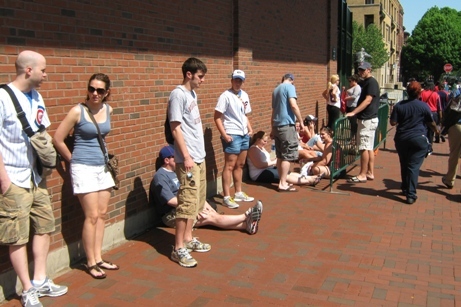 Like any classic ballpark, Wrigley Field bleachers remain the same…bench-style, no back to lean on outfield seating. A place to go and be in the sun on a beautiful summer day, drink beer and get loud, and surround oneself with lovable nuts that bleed Cubs blue. It’s where a Cubs victory is considered a bonus. 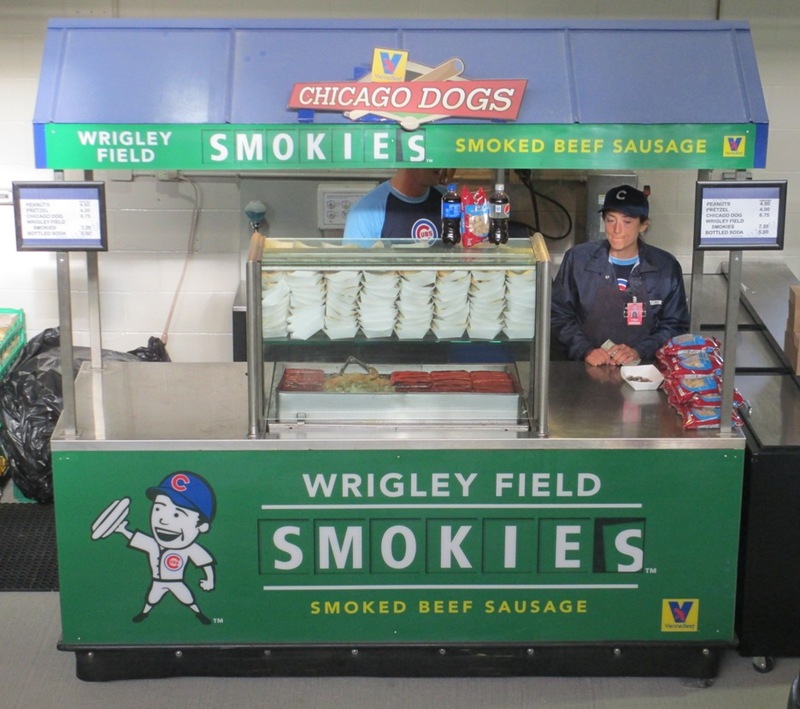 It’s not for “bleacher bums” anymore with current ticket prices…but the Cubs have also improved the food situation greatly and added some neat party areas for groups. There are some things you should know, though. OK, maybe not rules, but guidelines. This photo was taken several hours before the gates opened. Wrigley Field Bleachers, Rule #1) The bleachers are general admission—which doesn’t mean that the place turns into a mosh pit (at least most of the time), but it does mean that you have to get there early to stake out a good seat. The favorite spot of most fans is the front rows in left field, where batting practice homers provide a plethora of souvenirs for early fans. 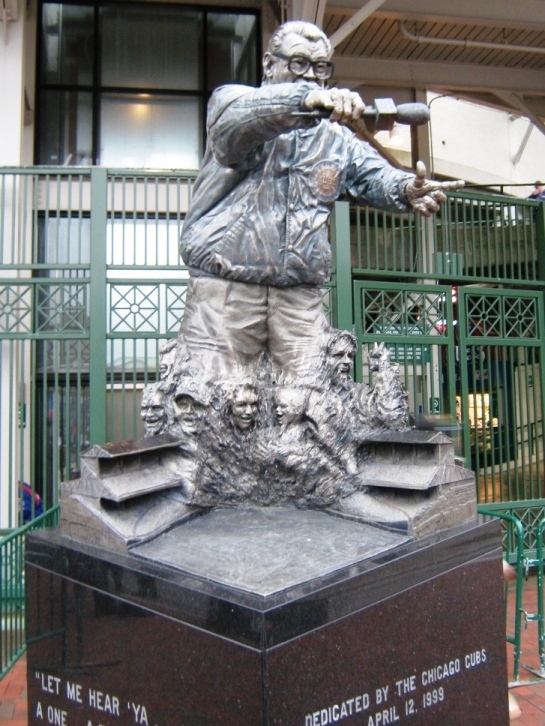 Bleacher fans meet at the Harry Caray statue. Not actually inside it as shown here. Wrigley Field Bleachers, Rule #2) The bleachers are also separated from the rest of the ballpark and have their own private entrance at the corner of Waveland and Sheffield Avenues. This is important. Other ticket holders cannot visit the bleachers, but bleacher ticket holders can access the rest of Wrigley through a walkway in the left field corner. This means that if you want pictures of the whole ballpark, or if you want to wander around the concourse before the game, you’ll likely forfeit your chance at one of the better seats. 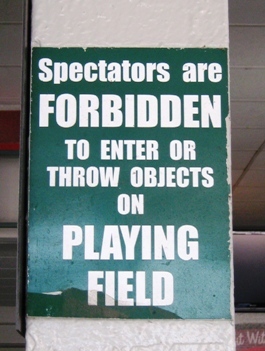 No entering objects on the playing field! Wrigley Field Bleachers, Rule #3) You should know that you will be expected to throw back a home run ball hit by the opposing team, even though the Cubs supposedly don’t allow objects to be thrown onto the field. A story is told about how a Reds player hit a home run that was thrown back hard enough to land near third-base coach Ray Knight, who picked it up and tossed it to a fan in a nearby section…who then threw it back onto the field. Knight laughed and tossed it into the dugout. Some fans carry another ball with them and throw that back on the field to keep the souvenir. If you can live with that on your conscience, go for it. Next time you pull up the Wrigley Field seating chart, check out the bleachers. You can take the tour and sit in the bleachers and that’s great, but the main attraction there isn’t the view, it’s the fans. Well, the fans and Hot Doug’s dogs.